If you collect signed waivers from guests using a waiver link, you’ll need to attach the signed waiver to a specific guest. From the booking details page. 1. Click the action button next to the guest whose waiver needs to be attached. 3. 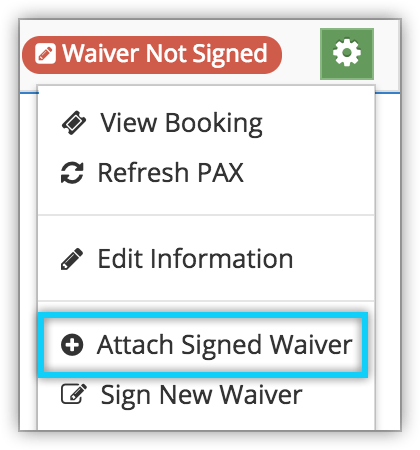 Click the waiver you want to attach from the list of unattached waivers. Note: If you want to assign a signed waiver to multiple bookings, you first need to enable that feature in your Rezgo settings. 1. Click the action button next to a guest in the daily manifest. 2. Click Attach Signed Waiver.